Game Gear titles Sonic Triple Trouble and Shinobi have been rated by US ratings board the ESRB for the Nintendo 3DS system. Nintendo announced March 2nd last year that Game Gear games are coming to the Nintendo 3DS Virtual Console library, with SEGA Japan following up the next day with a list of five games they planned to release, which included Sonic Triple Trouble and The GG Shinobi. Could this rating indicate that we may be seeing Game Gear titles on the Nintendo 3DS in the US sooner rather than later? Maybe it has some relation with the recent Shinobi game for the 3DS game and Thursday being Hedgehog Day? Finally. I got Sonic 1, 2 and Chaos (all Master System) last year on the Wii VC and loved them – they felt like lost treasures that I never really got a chance to play as a kid. I was waiting for this to come out. Interesting choice. Ya know, I’ve heard that Sonic Drift 2 will be released on the eshop. SEGA Japan listed it for release over there in Japan in March last year. Sonic Triple Trouble was on that list, and it’s now been rated by the ESRB, so Sonic Drift 2 is pretty likely for a release outside of Japan now too. Since both S4: E2 and Sonic TT were rated at the same time, and Sonic Drift 2 is on the same list as Sonic TT… if we find out when Sonic TT or Drift 2 will re-release, then Sonic 4: Episode 2 must be around the same time! I was wondering what was happening with that, haven’t heard anything about the GG games on 3DS in a while. Hopefully this means Sonic Triple Trouble will be on the 3DS very soon, I’d love to have it on mine. Same here. 🙂 I want to play STT on my 3ds. I just hope the controls will be super responsive. WHile that is somewhat possible it’s also kinda unlikely since STT is a finished game being ported and S4Ep2 is in development. Looks like Fang saw the wanted poster in Generations (Xbox) and ran to the e-shop. I know it is probably just Sega selling their re-re-re-releases again on another console. But i really hope there is something to them choosing the games from the Game Gear that have Nack the Weasel/Fang the Sniper in them. I would love to see him get a modern redesign and be reintroduced into the next main series game. 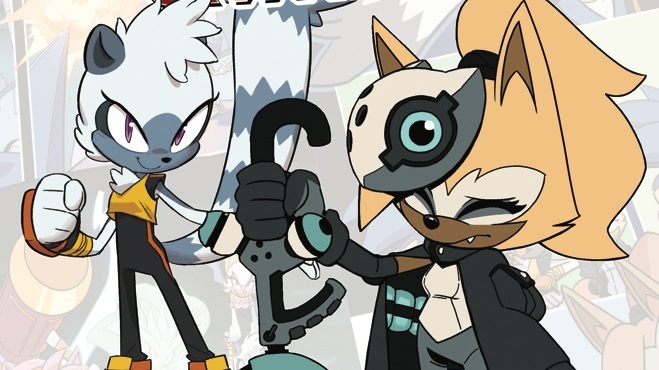 The series could use the return of a bad guy that’s out for personal gain, could potentially work for Eggman (bounty hunter for hire and all) and won’t end up joining the good guys like all the other rivals have ended up doing…except Metal Sonic thank god. The baddies are seriously outnumbered at the moment, bring back Nack/Fang!!! and just got sonic 4 episode 1 on android so don’t know but maybe episode 2 follows on android? Okay considering getting a 3DS right now. C’mon SEGA! You know we want it! I played Sonic TT on the PS2 port. It was perhaps the best Sonic game gear game. It had good graphics, nice level design and the controls were good. As for a good enemy for Sonic how about using grounder and scratch. Remember them from ‘Adventures of Sonic the hedgehog’. They were known as the ‘Super Special Sonic Search & Smash Squad’. Is Sonic and SEGA All Stars Racing Arcade was been released already? It should the games all be released in this year like: Dave & Busters, Chuck E. Cheese’s, etc….. Cool. Right now I’m saving for 3DS so maybe I will buy it as well because I never managed to put my hands on this title. 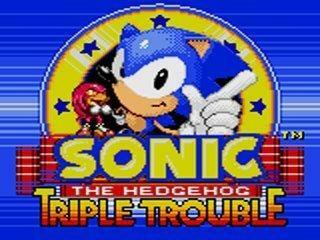 Actually Sonic Triple Trouble is to be released this summer according to a game site.